especially bacon and lamb. He was a member of the Country Land Owners Executive. After the death of his father in 1982 he entered the House of Lords, taking up several briefs for the CLA. He was appointed a Trustee of the Chevening Estate (by Mrs Thatcher) in 1979; he always thought that the re-establishment of Chevening under his chairmanship was the best achievement of his life. He was a Deputy Lieutenant of Kent. One of his other great interests was Freemasonry. He rose through the ranks to become Pro Grand Master, second only to His Royal Highness the Duke of Kent, who is Grand Master. collections from members of his close family who had been collectors. But it was a chance purchase of an Australian collection that led to his forming the highly specialised material now being auctioned. When he realised that additional material was becoming harder to find, he turned his attention to forming specialised collections of Gambia, Gibraltar and Malta. In later years he was never happier than when he was able to fill a gap or to locate a better copy of something he already had, more often than not from Club books from the Royal Tunbridge Wells Philatelic Society, where, at the time of his death, he was President elect. 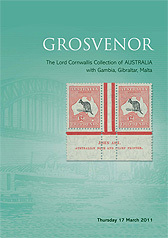 He was elected a Fellow of the Royal Philatelic Society London in 1988.